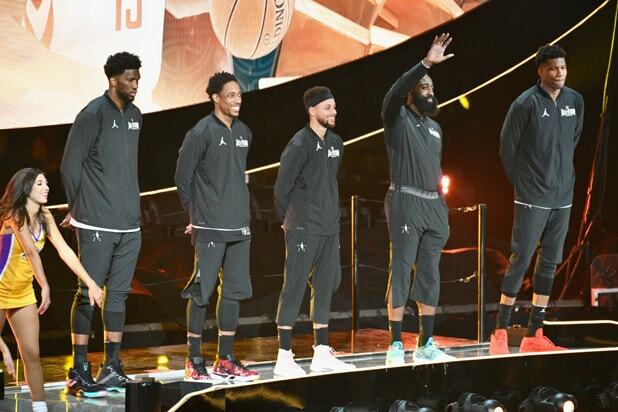 NBA All-Star weekend is always a splashy affair but when it's located in Los Angeles, it attracts a slew of entertainment and sports A-listers who didn't have to travel far to party with pro basketball's finest. Click through for the scoop on this year's hottest parties and coolest appearances (photos are in chronological order). 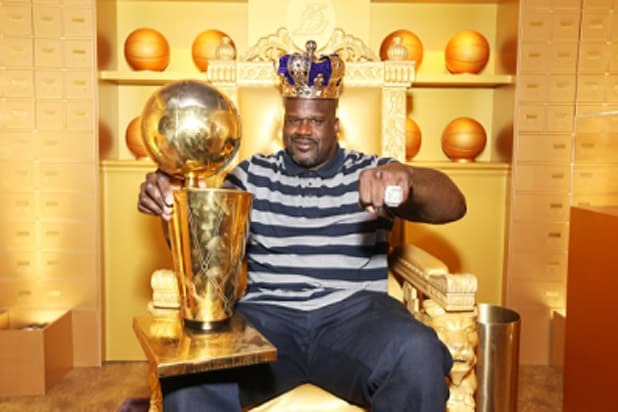 The biggest man in basketball (in every way), Shaquille O'Neal proved he is the real king of the NBA when he took to the throne at the American Express Experience on Thursday. 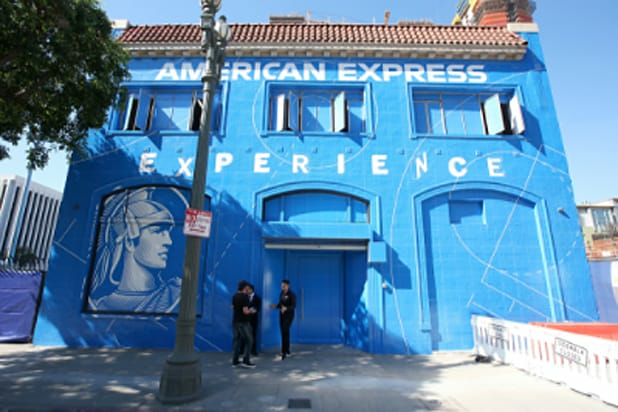 AMEX's intimate pop-up just outside of L.A. Live offered guests a multi-sensory journey of basketball through interactive rooms and instillations such as the Lakers Vault, a room of 18 handmade Chandelier Hoops and a walkway of Exploded Floorboards. The LED-lighted Neon Backboards created a surreal -- and very cool -- look at a pro basketball court ahead of Sunday's All-Star Game. The AMEX Experience delivered up twice as much of Maria Menonous as the SiriusXM host and "AMEX Ambassador" made fun Insta stories from the interactive displays. All-Star weekend isn't all about parties. The NBA also took advantage of having its most influential players in one place to give back to the community by having Kyrie Irving, Draymond Green and Swin Cash visit kids and their families at Children's Hospital L.A.
What's better than having Boston Celtics point guard Kyrie Irving read you "Star Wars" stories? Nothing. Veteran hop-hop genius DJ Whoo Kid (doing his signature salutes) took over the decks at the Let It Fly party Thursday night, as he spun in the middle of a pumping VIP room surrounded by towering NBA stars. The man of the night, Andre Drummond, hung out with Pittsburgh Steelers running back Le'Veon Bell at the “Let It Fly” event to raise money and awareness for the Precious Dreams Foundation on Thursday night, which was co-hosted by Johnny Stephene (a.k.a. Dribble2Much). Former L.A. Laker Carlos Boozer caught up with another ex-NBA player and undisputedly the best-dressed person at the Let It Fly party -- thanks to his pink satin jacket -- Jack McClinton. Who wouldn't want to sleep with -- we mean ON -- Steph Curry? Let It Fly party sponsors Active Dreamers make that dream come true with their line of bedding featuring top NBA stars. Before you call bias, they had a LeBron James bed at the party too! "Property Brothers" siblings Jonathan Scott and Drew Scott hammed it up for the cameras at the Celebrity Game Friday. While Jonathan wasn't playing this year, Drew made up for it by scoring a spot on the winning Clippers team under Katie Nolan. ESPN's Jemele Hill kicked off All-Star week in Hollywood on Thursday night at the "UNINTERRUPTED" party at Avenue Los Angeles, which was presented by Remy Martin. Former Clippers player Baron Davis hosted a trifecta of events All-Star weekend at the London Hotel in West Hollywood. His BIG Summit on Saturday afternoon featured a panel made up of Ice Cube, Chris Paul and David Robinson and co-founder/president of Lyft, John Zimmer. The power group discussed ideas on how to create real business and social impact, collaborations and opportunities that live at the intersection of sports, media, technology and culture, disrupting industries and enriching the communities. Jamie Foxx had to man up at Jack Daniels' "Blame it on the Game" party as he did shots with Guy Fieri. The Oscar winner also got to shoot hoops as he hosted the whiskey-fueled VIP bash on All-Star Saturday. The theme of giving back continued when Kendrick Lamar performed Friday night for the NBA on TNT American Express Road Show stage at L.A. LIVE’s Microsoft Square. The gig was exclusively for AMEX Card Members, and ticket proceeds will be donated to Big Brothers Big Sisters of Greater Los Angeles. Lamar put on quite the show, singing his hits including "Humble," "Swimming Pools," "Love," "M.A.A.D. City" and "Money Trees." Easy to spot in the crowd in the VIP section was TNT analyst "Sir Charles" Barkley -- who was an NBA All-Star a whopping 11 times during his career. While "Black Panther" was blowing up the box office this weekend, Chadwick Boseman was blowing up the NBA party scene. Marvel's latest breakout star actor was the man everyone wanted to see at GQ's effortlessly-stylish party at the NoMad Hotel in downtown L.A.
Before she took to the stage to perform, rapper and singer Cardi B looked slick in black leather at the GQ party. Cleveland Cavaliers star Kevin Love was dressed fit for a cover of GQ, not just the party, as he arrived with model Kate Bock. It was a beer lovers paradise on Saturday night at Budweiser LIVE as T-Pain took to the stage at the City Market Social House. The cool warehouse vibe was enhanced by a basketball arcade and endless Bud on tap. Levi’s also offered denim trucker jackets and tees that were customized onsite with screen printings, patches and pins. On the eve of the All-Star game, LeBron took a break from the serious stuff to kick back with Odell Beckham Jr. at the Beats party at the Dream hotel in Hollywood on Saturday night. Tristan Thompson and Khloe Kardashian proved "The Game Is Everything" by attending a VIP dinner at Beauty and Essex Saturday night. Other famous diners included LeBron James, Jessie Williams and Kevin Hart, no doubt enjoying cocktails from Rémy Martin and a tasting of their LOUIS XIII.